Bracelet "Python" - Military styleBrutal bracelet "Conquistador" for a real man! Celtic bracelet and earrings - set 2. Classic Military style from British Army Paracord (Paracord color: olive or black) - tight but elastic weaving. Almost weightless! 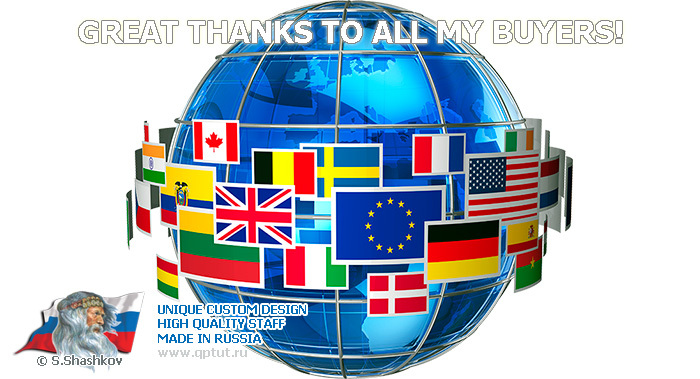 Exclusive = author's work (weaving one thread) = Made - in - Russia = High Quality! = Original! Paracord Jig "Soldier of Fortune"
Weight of the base complex - 350 gr. The Paracord Jig "Soldier of Fortune" is: you can work almost with any type of accessories for paracord! 4 stainless steel quick-clamping screws to attach the coupler-pillar to the base. Paracord Jig "Soldier of Fortune" assembling into working condition: less than 30 sec! You do not need to use tools to assembly the Paracord Jig "Soldier of Fortune"! All the attached parts of the Paracord Jig "Soldier of Fortune" are placed inside when it’s folded (like in box) Inner space of the Paracord Jig "Soldier of Fortune" allows to store inside an extra sets of needles to work with paracord and some other useful stuff. Because Paracord Jig "Soldier of Fortune" has anatomically smooth contours and plastic end caps - there will be no problem with scratches on the table or there will be no damages on your clothes! Work, carrying and storage of the Paracord Jig "Soldier of Fortune" will be maximally comfortable and convenient. Both working surfaces have limited borders. They help not to drop needles from the Paracord Jig "Soldier of Fortune" in the working process. It’s comfortable to use the Paracord Jig "Soldier of Fortune" even travelling by car, train, airplane and even ship. It is recommended to remove the coupler-pillar and to store the Paracord Jig "Soldier of Fortune" in a folded state after work. (Convenient and does not take much space). The Paracord Jig "Soldier of Fortune" is fully adapted for mobile use (tourism, army) with temperatures ranging from -10 to +70 degrees Celsius. Dear hobby colleagues! Because I make all the Paracord Jig "Soldier of Fortune" in small amounts, I guarantee high quality of the Jig!